Find me a person on the planet that hasn’t heard of, seen or played with a Lego brick and I will find a needle in a haystack. Lego has become a household word, and since the first Lego set was built in 1949, this Danish toy powerhouse has even overthrown Mattel in the Toy industry. Most of us know certain fact about Lego, like how much it hurts to step on a piece or that every vacuum in North America has sucked up a piece or two. We have heard or read that Lego means Play Well in Danish, and Ole Kirk Christiansen was the creator of the Lego company. So how about a list of things you may not know? A list of trivia Lego inspired information that will make for great dinner conversation (just not on a first date perhaps) is what we bring to you today. The first Mini Figure created by Lego rolled out of its mold in 1978. 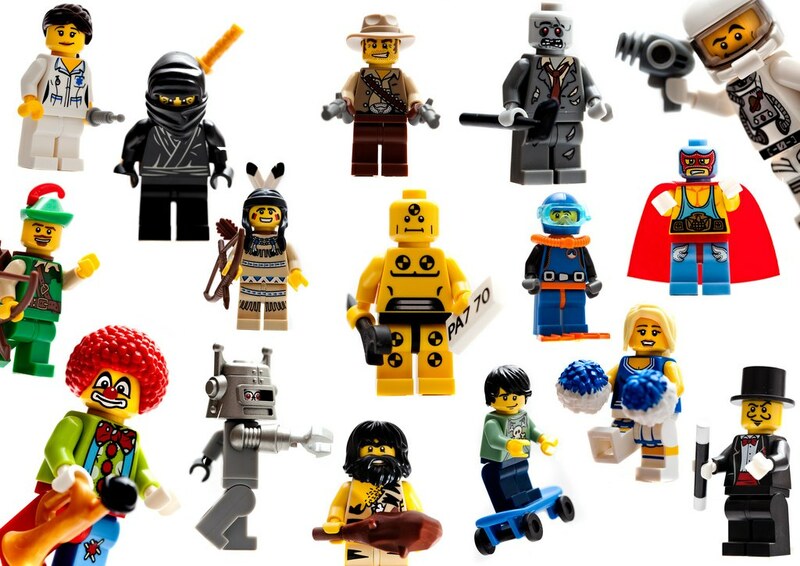 These collector Lego beings are four bricks high without a hat, don’t have noses and if they were included as a race, would be the largest population on earth. Since their creation, there have been over 4 billion mini-figures made. With the exception of individual franchise mini figures, all the heads are yellow. Lego felt that yellow was the most racially neutral color. You would be hard pressed to find a mini figure with a brain because all the heads of mini figures are created hollow to lessen the chance of choking if swallowed. Lego has created many metal mini figures. From the Jupiter collection of three that went into outer space to the 14k gold C-3PO and Mr. Gold Exclusive, there are lots of shiny little Lego figures. If you take those out of the equation, the rarest and most sought after Lego Mini Figure is Boba Fett with printed arms from the Star Wars Cloud City set. There are a bunch of exclusive mini figures that are produced for Comic-Con events and if you ever venture to one, make sure you keep your Mini Figure Exclusives. They are worth a pretty penny. Including retired colors, there has been a total of 182 colors created by Lego, and 14 of those have been transparent. Presently, just over 50 colors are being used. At any given time there are usually 6200 individual Lego Elements produced. Since the beginning, though, there are sources that say over 61000 unique pieces. Each mold can make 100,000 pressings before it needs to be replaced. If you look on the inside of each Lego piece, you will find a number inside. This number references what mold it was created from. Three 8-stud bricks can be combined 1060 different ways. If you are looking for years of excitement, try finding over 915 million different ways to combine 6 8 stud bricks. The combinations are endless indeed! Since the first brick rolled off the Lego production line, there have been approximately 500 billion Lego Parts produced (up to 2013 at least). Only 18 of every million bricks do not pass quality control equaling a total of 10,080,000 pieces have ended up in the recycling bin at Lego. 7 Lego sets are sold every second so in the time it takes you to read this entire article, 3234 lego sets were purchased! Lego is the largest producer of vehicle tires in the world. They beat out Goodrich, Bridgestone, and Michelin with an average annual production number of over 381 million tires. With the creation of Lego came the evolution of building models. Lego has been used to create some exceptionally large models and structures that have made their way into the Guinness Book of World Records. The tallest Lego tower stands 116’ 4” tall and is located in the German Legoland. The longest Lego structure is 5179’ long and is located in Italy. If a tower or long structure does not sound so exciting, how about the largest Lego house? In 2004, James May built a life-size house out of 3.3 million bricks, and it even comes with a working toilet, shower, and bed. You can find many lego images of substantial size as well. A façade of a building in England was produced using over 1.2 million bricks. A supercar was created in Chicago with 650,000 bricks, and a ship was built for the 150th birthday of DFDS Seaways and measured over 12 meters long and weighed over 3 tonnes! With so many creations made for the Guinness Book of World Records, you know that Lego has reached new heights with people and their creativity! When The Lego Movie debuted, the Lego fanbase exploded and made this film a real success. With revenue of just under 600,000,000, the little mini figure gained Hollywood stardom. The release of Lego Batman has everyone buzzing, and critics estimate its success will overtake even the Lego Movie. In the comic film release of Antman, you will see Antman being sucked up at the same time as a yellow Lego Brick. Jackie Chan has a fantastic fight scene in a Lego Expo in the movie New Police Story. Jackie Chan will be the new voice in the upcoming Lego Ninjago Movie. If you are a fan of Big Bang Theory, you have probably noticed a few episodes where Sheldon in playing with Lego. He has built the Star Wars Death Star as well as a police station. There are so many cool and exciting facts about Lego, and we have tried to capture the best of the best. Sit back and challenge your friends and family with some Lego trivia that will blow their mind. At the end of the day, you are going to be the most well versed Lego fan and will hopefully learn a few amazing facts about Lego along the way.